Cost management is an important concept in Octopus as it helps decision-making in relations to operation and maintenance costs. This wiki explains the concept of costs in Octopus and how to use the various information related to costs. CI: For a more detailed description on cost management related to CIs, consult the CI cost management wiki. Imported costs: The cost cumulation from a tier system when migrating to Octopus. This value is fixed and cannot be modified or updated. Activities: Costs associated with time entries in activities from a request. Consult the Activities in Octopus wiki for more information. Parts: Costs linked to parts used in requests. Consult the Parts management wiki for more information. Incident > KPI (Key performance indicators) report: Report showing the cost per incident based on selected criteria (time interval, site, department or group). Service request > KPI (Key performance indicators) report: Report showing the cost per service request based on selected criteria (time interval, site, department or group). 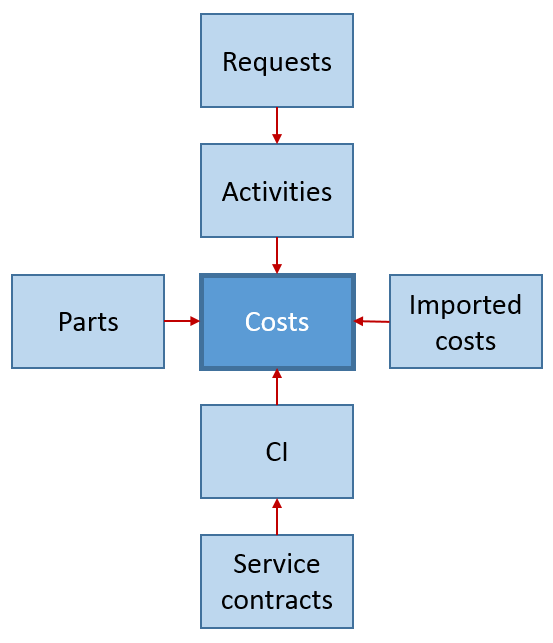 It is possible to consult all the costs linked to a CI by opening the Costs tab of the CI. The cost calculation for the CI takes into account the various costs associated with the activities, parts and contracts. It allows when migrating from a system to import the cumulated costs from that system. Note that the calculation of the Total Cost of Ownership (TCO) does not take into account lease contracts associated with the equipment. 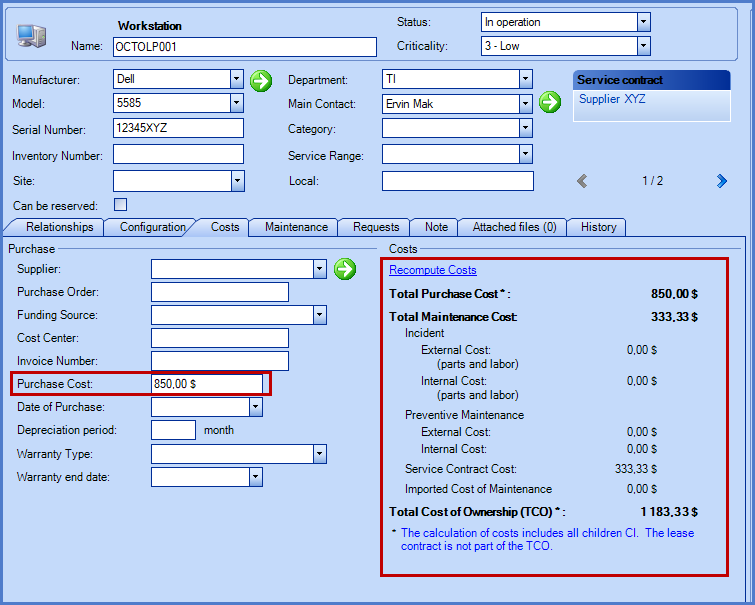 Depending on the activities, parts and external labour used in a request, it is possible in the activities section to see the total cost of a request. The hourly rate used to convert hours into amounts is defined in the reference data management in the associated group. It is possible when creating a custom list to extract information using search criteria based on the different costs. It is also possible to select columns containing costs to display, group or sort this information or export it to Excel. The costs are good indicators for decision-making. Cost management requires rigorous capture of information. You need the collaboration of your teams or the information will not be representative.